Arts Catalyst and The Otolith Collective are launching Undisciplinary, a new residency supporting three UK-based artists, curators and cultural practitioners. At a time when the cracks and fault lines of contemporary neoliberal society are becoming more visible, how can we, as cultural producers, address notions of power, access and equity? And how can these macropolitics shape the micropolitics of the field we inhabit – the visual arts? 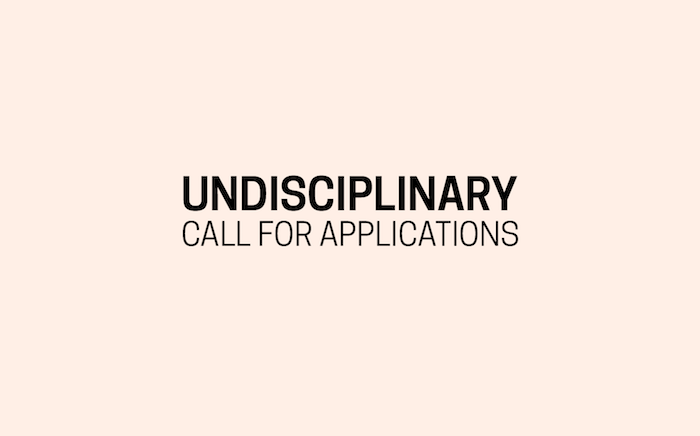 Emerging artists, artist collectives, curators, cultural practitioners and writers whose research focuses on critical issues in global perspectives of the 21st century are invited to apply. We are particularly interested in hearing from practitioners whose research addresses the politics of ecology, gender and race, contemporary activist struggles and from those engaged with rethinking genres of the human in relation to the Black radical tradition. Piloting from April 2019, this month-long residency will provide learning, networking and mentoring opportunities as well as a critical framework for challenging existing structures that underlie artistic and cultural production. A number of partner organisations will be involved to provide further opportunities for residency participants. There is no expected exhibition at the end of the residency rather, a desire to develop a platform for the research through seminars, screenings, podcasts, a reading room etc. A dedicated research space will be available at Arts Catalyst throughout April 2019. We encourage the three residents to be active in the space during this period. Applicants should be UK-based and have been out of formal education for at least one year. We welcome in particular applications from artists and curators from BAME backgrounds. The application should be sent in the form of one single PDF to opportunities@artscatalyst.org . Successful applicants will be notified by 15 February. Arts Catalyst is a contemporary art organisation focused on transdisciplinary art and inquiry. It commissions and produces projects, artworks and exhibitions that connect with other fields of knowledge, expanding artistic practice into domains associated with science and specialist research. Arts Catalyst has commissioned more than 160 artists’ projects, including major new works by Tomás Saraceno, Aleksandra Mir, Ashok Sukumaran, Otolith Group, and Critical Art Ensemble. Arts Catalyst’s Centre in King's Cross, London, is a hub for the organisation’s work, nationally and internationally, providing a space for developing new projects and co-inquiries connecting local interests with wider planetary issues. The Otolith Collective expands on the work of The Otolith Group , which was founded in 2002 by Anjalika Sagar and Kodwo Eshunin. It is a curatorial public platform through which exhibition-making, artists' writing, workshops, publication, and teaching are aimed at developing close readings of images and sounds in contemporary society. Approaching curation as an artistic practice of building intergenerational and cross-cultural platforms, the collective has been influential in critically introducing particular works of artists such as Chris Marker, Harun Farocki, Anand Patwardhan, Etel Adnan, Black Audio Film Collective, Sue Clayton, Mani Kaul, Peter Watkins, and Chimurenga in the UK, US, Europe, and Lebanon.